There’s less than two weeks until Election Day and we need to make sure all REALTORS® here in Siskiyou County vote. As REALTORS®, it’s our job to protect home-ownership in California. 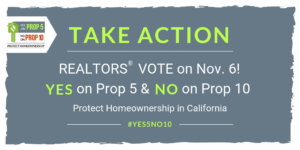 If you’re a Vote by Mail voter, return your ballot today and vote YES on Prop 5, C.A.R.’s Tax Fairness Initiative and NO on Prop 10 that will allow for the dramatic expansion of rent control. If you are not signed up to Vote by Mail, plan to vote Yes on Prop 5 and No on Prop 10 on election Day, November 6th. 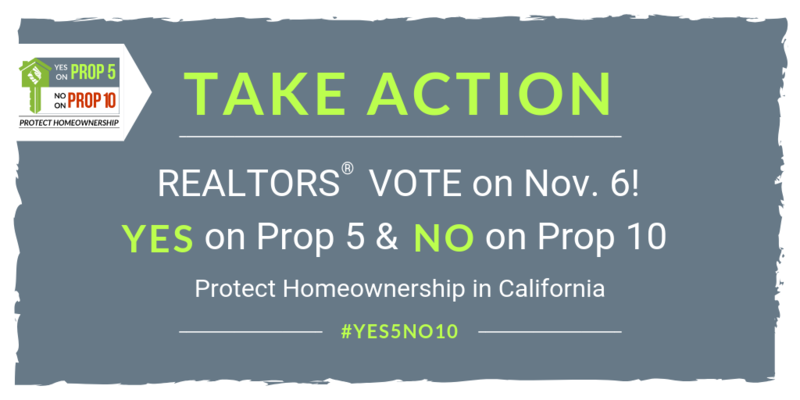 Prop 5 and Prop 10 will change housing in California for years to come – so make sure your voice is heard. Vote TODAY by returning your ballot and get involved to help spread the word of #Yes5No10.